After going to two events that uplifted myself I wanted to bring some insight from a rebel to another rebel. The events I went to was Commemoration on Dr. Martin Luther King, JR. with keynote speaker Dr. Eric Michael Eric Dyson, where it was about how to keep ourselves talking about issues we don’t want to talk about. And National School Choice week where we all have a choice on what school we want for our K-12 students to go like Charter schools. This has inspired me to do more and talk more about how a fashion rebel can contribute to society. And by doing this I’m planning to add additional rebel guides/ video blogs. I feel a rebel resides every where and comes in every shape and size. Being a rebel means you have to live it and speak it. “Rebel because it is your right to push the boundaries because nothing is off the table for discussion.” Rebel quote by me. So this post is about pushing boundaries and talking about what we don’t want to talk about in our society with images. There will be more to share this week. 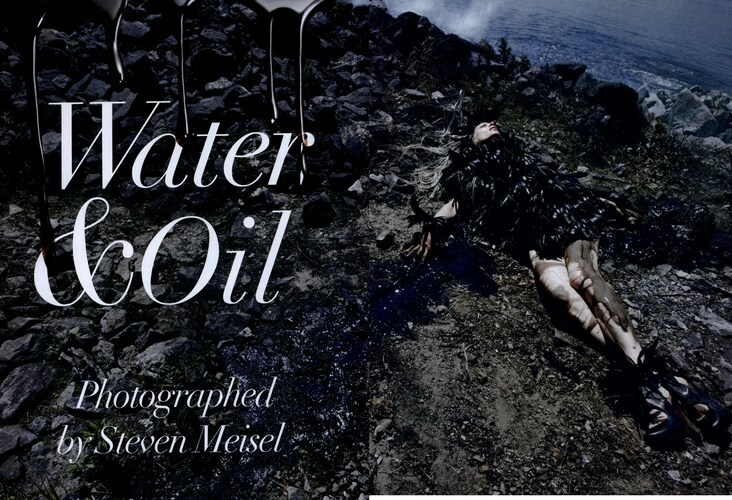 (Photos from Vogue Italia Aug 2010 and photographed by Steven Meisel) This spread caused a lot of chats and made us think about our environment and how important to take care of our earth. Let’s talk about our earth and the dangers of we cause to the earth. I know we don’t intend to release chaos but it is time to talk and to do things differently.